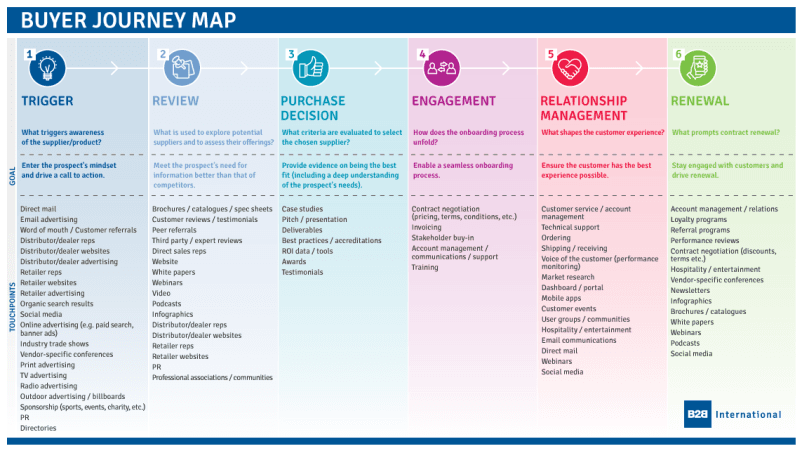 Most researchers and those involved in research circles are by now extremely familiar with the term “Customer Journey”. It entered the insight mainstream in 2012-2013 and has since become the all-encompassing descriptor of studies which explore the interactions between a supplier and its market. The challenge with “Customer Journey” research is it tends to be restrictive in two key facets. First, it usually focuses on customers only (excluding prospective customers). Secondly, it usually starts at the point at which the customer actually becomes a customer. It excludes what researchers are now calling the “buyer journey”, or the “path-to-purchase”. The idea of exploring buyer habits and behaviours has of course been around for a while, but it is only in the last 18 months that it has begun to gain momentum as a piece of research in its own right. All too often, path-to-purchase studies only go back as far as the first direct interaction between the buyer and the seller; the customer and the client. There has been a shift in buying habits, driven by the desire on the part of buyers to be more independent and well-informed. The resulting pre-shopping stage – often conducted online – was coined The Zero Moment Of Truth (ZMOT) by Google. Investing in the ZMOT helps companies to “get in the door” earlier than the competition and to build a competitive edge. The importance of digital in the early stages of b2b purchasing is not to be underestimated. Research by BCG suggests that 89% of b2b researchers use online sources during the research process, with an average of 12 searches being performed prior to engaging on a specific brand’s site. In fact 41% of b2b revenues are generated from purchase journeys which start with online research and are following by human interaction. Companies should seek to identify and understand the ZMOT in their market’s path-to-purchase. Doing this is difficult because they are often more difficult for buyers to pinpoint. The study should seek to tease out these details by exploring purchase triggers and ongoing buyer research not necessarily linked to a specific purchase. There is often an insatiable appetite for quantitative data on the path-to-purchase. Companies want to make decisions with confidence and statistically robust research provides it. There is however, only so far that quantitative measurements can go in informing buyer behaviours, and crucially, their mindset throughout the journey. Qualitative insights – however they are captured – can enable companies to truly get under the skin of the buyer. There is real value in the detail and in data which brings the path-to-purchase to life; often, it is the juicy quotes and talking heads which truly engage internal stakeholders, enabling them to contextualise the insights and link them to see the people behind the numbers. It is not in the least bit groundbreaking to say that the decision making unit in b2b markets is a complex beast. And yet, many companies assume that the DMU is homogenous, with a linear process driven and dominated by one primary decision maker. To understand this person’s path-to-purchase is to understand the full picture. Not quite. Who are the key stakeholders and what are their specific roles? How do these stakeholders interact with one another? When does each stakeholder enter and exit the path-to-purchase? Most companies will find that various individuals, teams and even functions, drop in and out of the buyer journey and will not be involved from start to finish. The puzzle is therefore rendered incomplete without establishing the entire DMU and the linkages which form within it. That usually means working “horizontally” within target organisations: gathering insights from one individual and then fanning out to uncover (and subsequently cover) the whole decision-making web. In business-to-business markets, the channel is often “king”. Distributors, resellers, dealers: whatever the term(s) used, these “middlemen” are a critical part of the path-to-purchase and often the eyes and ears of the market for the supplier of goods/services. While end user insights will undoubtedly cast light on the relationship with the channel and their involvement in the buyer journey, soliciting the perspective of the channel partners themselves will enable a more holistic view. Depending on how engaged channel partners are, companies may find that it’s possible to conduct ethnographic research at the actual point-of-sale (e.g. through site visits or joint sales calls) to bring fresh insights on the purchasing interactions. Respondents can find it difficult to recall specific details of their buying experiences. Imagine being asked about a purchase you made last week: how many websites you visited, and specifically what you searched for, and how long you spent on each website, and how many people you called, and what questions you asked. Now imagine that you are asked those same questions about a purchase you made six months ago. Now imagine that since that purchase, you’ve made dozens of other purchases of other products/services for your business. Therein lies the trouble. For path-to-purchase research, the devil is in the detail. Unfortunately for researchers, the detail is devilishly difficult to capture, at least accurately and reliably. Wherever possible (and this is much tougher of course for b2b buyer journeys than for consumer), companies should extract real-time insights from an ongoing path-to-purchase, to mitigate against memory bias. This could include aforementioned ethnographic research, or diary exercises in which the buyer records interactions immediately after the fact. In consumer circles, passive metering is becoming more feasible: this is when consumer digital behaviour is monitored in the background (subject of course, to the respondent’s prior consent). This is far more difficult for b2b markets where the path-to-purchase may be much longer, but as the technology is developed, it may have some equity for b2b researchers. Market research of any kind is most effective when it leads to strategic decisions, while also informing tactical actions. The same is true of path-to-purchase research. I have seen first-hand the difficulties of being too strategic when looking at the buyer journey. The risk here is that company stakeholders feel underwhelmed by the results, seeing them as “too high-level” and “simply confirming what we already knew”. These strategic insights obviously have value. They can stimulate a critical examination of the Customer Value Proposition (CVP). They can help companies to identify segments to prioritise, and/or segments to ignore. They can provide direction on marketing budgets and allocation of sales resources. The problem though is that additional insights are needed to inform the specifics, leaving empty value propositions, underserved segments and unspent marketing dollars. The tactics – in the case of path-to-purchase research – are the minute details which may seem benign, but when combined create a powerful set of insights which can lead immediately to action. For example, when researching website behaviour, it is not enough to say that SEO strategy is the name of the game. Companies need to know which search terms buyers use. How many websites do they visit? What’s the first page they are likely to land on and how long might they spend looking for what they need? Path-to-purchase studies cannot be truly empowering with strategy but not tactics, or vice versa. 7. Understand the fundamentals of a winning content strategy: who, what, where, when, and how? It is one of the true bugbears of research sponsors to have a study which answers one question but fails to answer four others. It is probably more frustrating than having a piece of research which doesn’t answer anything, because it provides at least the illusion of insight, and then pulls it away by not filling in the gaps. Who within the buyer organisation requires/desires content? What types of content resonate most strongly with each influencer? What information are they looking for specifically? Where should the content be placed in order to reach them and to have the best chance of “landing” (seller website, channel website, independent website, trade press, events/conferences, sales rep relationship, POS materials, direct marketing, etc.)? When during the path-to-purchase do they need the content, what is their mindset at this stage and what are their aims? How should the content be presented to the influencer; what is their preferred media (video, case studies, reviews, white papers, infographics, ROI calculator, etc.)? A piece of research which focuses and refuses to deviate from these questions is one which stands an excellent chance of being successful. Once concluded, the resulting insights should be able to clearly inform recommendations on how to deliver content at the right time, in the right format, through the right channel/source, to the right people, with the right message.